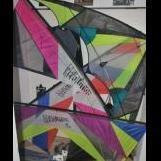 Or any other large dual line kite. I have a primere addiction. It is on the larger side but not as large as 9ft. That's a very nice kite, but I'm looking for kites that can really pull and 9ft and up can do that. hi Geo, how is your quest for the power kites going? I might have a couple you may be interested in. they are older kites that have been well loved but still fly very well. I'm always looking for the big boys. What do you have? Please PM with your list. Your 5 meter kites are they framed or are they foils? I'm old school, I prefer framed kites. Great! It’s a fun flying kite!